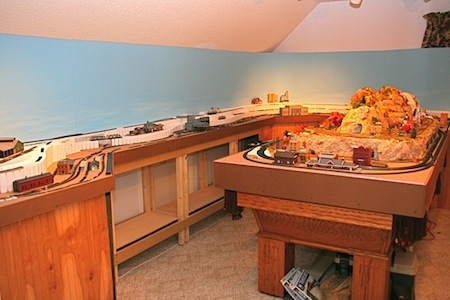 My first attempt at creating a model railroad empire began in 1990 in an attic "train room" that was anything but conducive to building and operating a railroad. Looking back on it, it seems amazing that I spent as much time as I did working on that layout, which went on for several years. The attic was not sealed from the outside and it had no air conditioning or heating. It was very hot and humid in the summer and very cold in the winter. Dust was a constant problem as were the bugs. It was not unusual to find that one of my trains had derailed by hitting some kind on insect laying on the track. Track cleaning was never-ending. Nevertheless, the railroad was built and the trains ran, and I was proud of it. After a while, however, I began to long for better surroundings in which to practice my chosen craft. Ultimately, we had part of the attic finished off creating a 19x13’ room, painted sky blue with white ceiling, central and track Halogen lighting. Alas, the train room looked too good, unfortunately, and we ended up putting a pool table in there and used it to entertain family and friends. I restarted a new HO railroad on a 4x8’ table in another room. I worked on this for several years, but I wasn’t really happy with the track plan or the scenery that I had created for it. Eventually, I took this down and started a new N-scale layout in a small bedroom on a 3x6’ table. I was happy with the way this one turned out but after 2 years of filling up that space, I definitely needed to expand. Finally, the poolroom was not really being used any more, so I was ultimately permitted by the “Housing and Space Allocation Director” to use it for what it was originally intended for anyway – the trains. I promptly moved my 3x6’ N scale table into the new train room and set it up in the center underneath the central light and fan that was in there and began planning the expansion. I liked the track lighting that had previously been installed in the room and directed the lights onto the layout. The switch to control the track lighting has a dimmer that I can adjust to create the effect of dusk, which really enhances the effect and mood of the lighted trains and structures. I also liked the effect of the Halogen bulbs, which seemed to be more like natural light than many fluorescent bulbs that I had seen. However, I now know that there are different kinds of fluorescent lights, some of which are much more natural appearing than the industrial kind used in warehouses. You can find some of these more natural fluorescent lights in aquarium stores and probably other places as well. In the past, it wasn’t possible to dim fluorescent lights, but now, I understand that there are dimmable fluorescent lights available. I am planning at some point to place an orange or red rope light or electroluminescent cord around the periphery of the layout to create a sunset effect, although I haven’t done this yet for this layout. A small desk in one corner of the room serves as a workbench containing many of the small tools, paints, glues, etc. that I use on a regular basis. For other things that aren’t used as often, I have plenty of storage under the benchwork. Altogether, I am very happy with the nice clean, carpeted room that I have now, with air conditioning, heating and a bug-free environment; and for the moment, the lighting is pretty good and not begging for replacement, so I will leave it as is. It is certainly a world of improvement from what I have worked in before. I also have a small TV and stereo in the room for when I’m not listening to train sounds. Overall, it’s a pleasant environment, which is really very important for a place where so much time is spent. It certainly has added to my enjoyment of the hobby. From "Train Room" to "My Train Layout"
From "Train Room" to "HomePage"